Photo provided by Destination Gettysburg. Pennsylvania’s Dental Meeting has a new one-day format offering CE and the opportunity to attend PDA’s business meeting and town hall open forum. 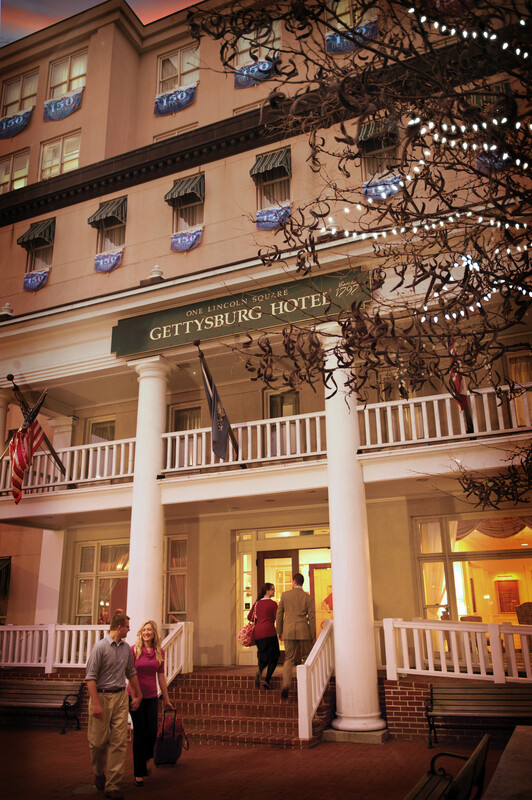 Plan to visit historic Gettysburg, PA, and enjoy sessions designed to inspire and educate. Non-dentist dental team members who are not attending the course with a dentist should download the two-page form available November 7 at www.padental.org/PDM. 1. Sign in to the website. Every dentist has a record. For most dentists, your website default username is your first initial, last name and four-digit year of birth with no spaces. The password is lowercase ada and your ADA number. If you don't remember your username and password, please contact PDA's membership department. 2. Click the Register Myself button. Pricing will be applied based on your member status. Click the "Add" button to select the events you will attend. Click the "Add" button next to the events your guest will attend. Please contact Rebecca Von Nieda, PDA's director of meetings and administration, at (717) 234-5941, ext. 117 with any questions about the meeting or online registration. Please consider sponsoring a dental student who wishes to attend Pennsylvania's Dental Meeting. Add this event to your cart to select the chicken entree for the Board of Trustees' Dinner honoring those making an impact on our profession. Honorees will include PDA's outgoing president; board members who have completed their term of service and the 2019 PDA award winners that will be announced in late January. Event is open to all PDA members and their guests. Add this event to your cart to select the salmon entree for the Board of Trustees' Dinner honoring those making an impact on our profession. Honorees will include PDA's outgoing president; board members who have completed their term of service and the 2019 PDA award winners that will be announced in late January. Event is open to all PDA members and their guests. Add this event to your cart to select the vegeterian entree for the Board of Trustees' Dinner honoring those making an impact on our profession. Honorees will include PDA's outgoing president; board members who have completed their term of service and the 2019 PDA award winners that will be announced in late January. Event is open to all PDA members and their guests. Mix & mingle with friends and colleagues from across the Commonwealth. Registration is open to everyone! Registration is not limited only to those attending a session on Saturday. If you are bringing a guest, please follow the registration instructions to add a guest. Attend the meeting and visit the exhibitors without registering for a session. Available for member dentists and non-dentist staff of the dental office. Drugs and Supplements Affecting Patient Care Including New FDA Drug Approvals, Herbals, Antioxidants and Nutraceuticals presented by Richard L. Wynn, PhD. 4 CE credits recommended for dentists, specialists, hygienists and dental assistants. Pricing includes breakfast at 7:15 a.m. Presented by Francis G. Serio, DMD, MS, MBA. Co-sponsored by the USA Sections of the International College of Dentists and the Academy of Dentistry International. Periodontics CE attendees are automatically registered for lunch. Add this event to purchase lunch before PDA's business meeting. Presented by Francis G. Serio, DMD, MS, MBA. 3 CE credits recommended for dentists, specialists and hygienists Pricing includes lunch at 12:30 p.m.
PDA’s annual business meeting will be held Saturday, April 6 beginning at 1:30 p.m. with a legislative update. All PDA members in good standing are encouraged to attend. In addition to the update from our lobbyists, members will have the opportunity to voice their opinion on issues affecting dentistry and participate in the Bell/PDAIS Shareholder’s Meeting. There is no fee to attend the business meeting. Open to district and local presidents and presidents-elect.